Hello and Happy-Back-to-the-Grind-Day! Frankly, we’re rather pleased to be back to our more boring, dull, staid rut standard routine… are you? But we must interrupt our normal blogging. This could be it. The End of the world as we know it. If someone is able to assist TP in comprehending the pose assumed by Ms. Hilton, we are all ears. Really. We are presuming this is sufficient warning that you are able to gather the kids, the pets, the household staff, and perhaps a few photographs before leaving for the next life. There is only one way this might not be what it seems; there is every possibility someone tipped Paris to the fact we’re in the middle of TP’s “Pick the AntiPrep” voting and she simply can’t bear the thought of finishing second to Lindsay Lohan. “Preppiest…honestly….well I think Elizabeth Hasselback. You might not like her show or her politics (or you might like one or the other or perhaps both) but one must admit that both on-air and off she is awfully preppy. I think her style is rather adorable & she’s always appropriately clothed. And 2nd place goes to Suri Cruise. She is just always in her darling little dress, bob & patent leather shoes. Divine! So there you have it. Don’t say we didn’t warn you. On a far more delightful note, we promised to share the rest of the designer looks for Sasha and Malia Obama on Inauguration Day. Our first two are from Reem Acra, long a Princess favorite. Our only thought on these? While lush in appearance, pastel colors are generally not a first choice for either Michelle Obama or the girls. Next, an Olive Juice design for Sasha Obama, who is seven years old. Both looks are sweet and certainly age-appropriate, but not as compelling as one might hope. This may be a function of the black and white sketches, making it difficult to discern subtleties of design and color. We harken back to our original post with the Isaac Mizrahi sketch showing all three Obama ladies as it remains one of our favorite designs for the girls, as well as Mrs. Obama. We say this despite the neckline on Malia’s dress, really a bit outré for a young lady of that age. BTW, it was “Back to School” for the Obama girls this morning as they headed off for their first day at their new school (Sidwell Friends), although they are at different campuses. Judging by the draperies in the background we are are presuming this photo was taken at the family’s hotel (please don’t get us started on this topic again) in Washington. If looking for someone a little older, then the standard size Chocolate Polka Dots is always an excellent choice. The next two items are not at all preppy. TP Is well aware of this fact. Yet, yet we remain obsessed with their cute factor, which is off the charts and peaking in the red zone. They are called Qees, and absolutely TDF, at least IOHO. This one is name Pink Virus, and it is our favorite. 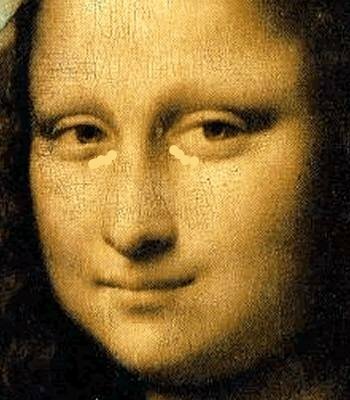 Probably because the shape of the head looks like a TV, reminding us (as well as The Princess Consort) of all those years working in teevee, feeling like our heads were to heavy to hold up for one more second. We *do* realize we couldn’t be remotely close to the demo the Qees people are targeting, but what the heck, right? It is TP’s tiny step into another world and it is too fun. On that happy thought, don’t forget to leave a comment telling us about your favorite AntiPrep personality of 2008! We present the Hermès Fortwo édition Toile car, unveiled last Thursday in front of the Grand Palais. 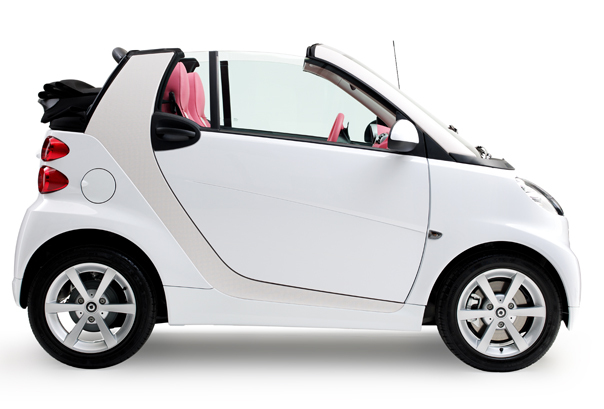 This creation is in honor of the Smart Car’s 10th Anniversary, and it will cost just under $50,000. It wouldn’t be for everyday of course, and only for certain locales, like Georgetown, or the Loop, perhaps Nob Hill. But not on the highway as almost anything else would turn us into Flat Stanley in an instant! Naturally TPC (The Princess Consort) will have to counsel the staff as a few may be concerned about job security if they aren’t driving TP; he is very good and will work with them to assuage their fears. But back to the car; of course it comes in other colors, like Hermès’ signature orange. 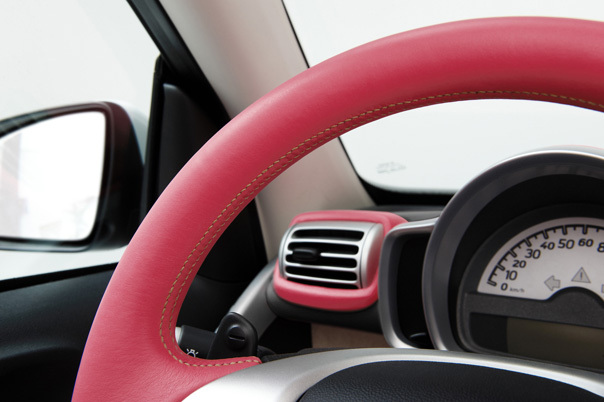 Each Smart car will showcase Hermès leather with covered steering wheels, including lime, navy, fuchsia and other colors. But if not in pink… what’s the point? So be they on apparel (where to start, really? ), on luggage (Louis Vuitton anyone? ), on eyeglasses or sunglasses (hello Tiffany? ), almost anywhere, they are hideous. 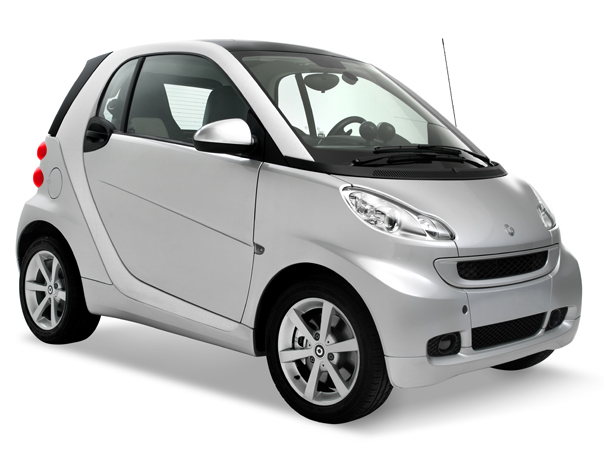 However, when it comes to the Hermès logo on the Smart Car, it is our understanding it is going to be quite discreet, in Hermès’ original canvas toile there will be the “H.” What do you think? BTW, our thanks to TrashBagAesthetics.com for their fab photos! We now know a bit more about some of the prep schools Michelle Obama was looking into while in Washington the before the President-elect arrived in town for their visit with the Bushes at the White House. One possibility is Georgetown Day; it is co-ed and teaches grades Kindergarten through High School. It was the first integrated school in the city, and also very progressive according to a story in today’s NY Post, with students and teachers on a first name basis. Below, a shot of the school yesterday following Mrs. Obama’s visit. Tuition here would be approximately $27,445 for grades 1-5. Other contenders include Sidwell, pre-Kindergarten through 12th grade is actually in the District proper. It is the Quaker school attended by Amy Carter and Chelsea Clinton; vice president- elect Joe Biden’s youngest son attends Sidwell now. According to Newsday’s story tuition at Sidwell runs $28,442 for pre-K through 4th grade and $29,442 for grades 5 to 12. Now it is time for the afore mentioned “True Confessions.” Yesterday we had occasion to spend a good portion of our day in one of the PrincessMobiles, driving halfway across the state. And back again. Having neglected to remember to bring the iPod (a gift from the Princess Consort!) we decided to take our chances with the radio. The buttons are all preset in a plethora of combinations offering a multitude of musical genres. So we reached forward and hit ‘On” and music filled the air. “Have yourself… a merry little Christmas…. And the confession? Yours truly did not immediately push another button, oh no. She sang along with Bing Crosby. And then The Carpenters (honestly) and then Aretha Franklin. And then we turned it off. The Consort is most concerned.